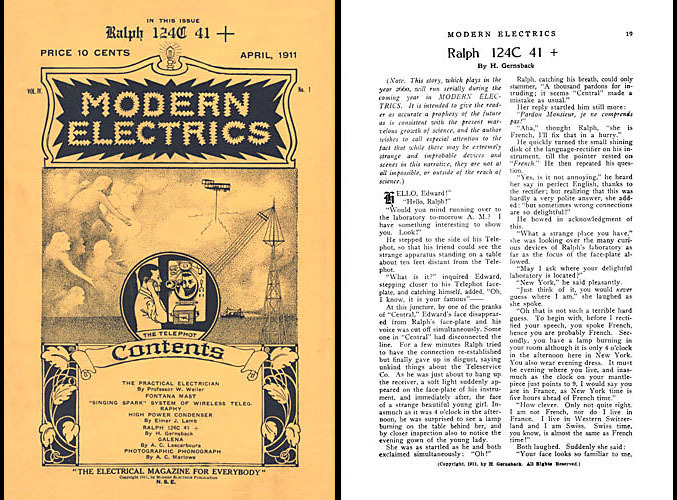 Modern Electrics - April 1911 - 1st Ralph 124C 41+ Downloadable PDF file. This is a downloadable PDF file of Modern Electrics - April 1911 - Hugo Gernsback's first contribution to Science Fiction - RALPH 124C 41+ (part 1 of 12). This is his premiere work of SCIFI that began a career which allowed him to be named "The Father of Modern Science Fiction". This issue pre-dates the Mars and Tarzan Adventures of Edgar Rice Burroughs. Possibly the rarest and most significant magazine Gernsback ever published. Every page from cover to cover is included in it's original printed form. A great item for scifi research and the collector who hates to handle his valuable original magazines.